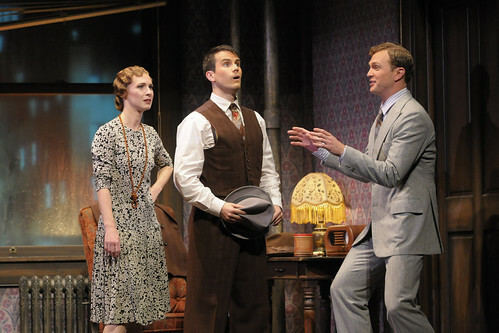 Jerry Hyland (John Wernke, right) makes an unexpected proposal to his vaudeville partners May Daniels (Julia Coffey) and George Lewis in ACT’s season-opening production of Once in a Lifetime by George S. Kaufman and Moss Hart. Below: Playwright Lawrence Vail (Alexander Crowther) and May (Coffey) compare notes on the craziness of Hollywood. Photos by Kevin Berne. American Conservatory Theater opens the season with a play that only American Conservatory Theater could do. And I mean really do – the way it should be done. The play is George S. Kaufman and Moss Hart’s Once in a Lifetime, a 1930 comedy that seems oh so very jaded about the new Gold Rush represented by the advent of talking pictures. What’s funny is that all the trashing of Hollywood types – dimwitted performers, egomaniacal studio heads, apoplectic directors, long-suffering writers – is so disdainful. But at the time of the play’s premiere on Broadway, The Jazz Singer, the first big hit movie with sound, was only three years old! What’s more, all those stereotypes feel strangely current, as if absolutely nothing in the Hollywood world had changed, but instead of the frenzy over sound, we have frenzy over CGI and gazillion-dollar budgets and opening weekend grosses. Turns out has been a laughingstock, especially to legit stagefolk, for more than 80 years. Once in a Lifetime is full of old-fashioned pleasures, and by old-fashioned I don’t mean quaint or sentimental. I mean that the three-hour, two-intermission structure helps the 2 ½-hour evening zip by. I mean the sets (by Daniel Ostling) fill the vast ACT stage perfectly and with just the right hint of theatrical opulence. And I mean it’s utterly delightful to see a stage so full of exuberant actors – 15 of them, many doubling, tripling and quadrupling their roles – all seeming to relish the crispy, fast-paced dialogue that makes you think the 1930s were populated by particularly punchy and verbose people. The fact that more than half the cast comprises current MFA students in ACT’s Class of 2012 or recent graduates of the program is just more reason to crow about this production’s pleasures. Director Mark Rucker has the touch here, combining just the right amount of zaniness, sophisticated comedy and human-scale sentiment. The most personable aspect of the show is its central trio, has-been vaudevillians May (Julia Coffey), Jerry (John Wernke) and George (Patrick Lane) who decide to cash in on the talking movie craze and start an elocution school in Hollywood. The zany element is represented by pretty much everyone else, from the hard-edged studio head Mr. Glogauer (the pitch-perfect Will LeBow) to the bizarrely elegant secretary Miss Leighton (played in deliciously daffy drag by Nick Gabriel). The world of Hollywood is evoked by Alexander V. Nichols’ wonderful projections, which include film clips from Al Jolson in The Jazz Singer to Bing Crosby in Going Hollywood to some hilarious audition clips and clumsy cinematic performances by some of the characters in the play. Watching movies in the gorgeous theater is strangely comfortable – perhaps because the theater regularly screened movies for decades. Amid the cast of loonies, several stand out. ACT core company member René Augesen hits all the right egocentric notes as a Hedda Hopper-like journalist and Jessica Kitchens is a hoot as a silent film star whose imperfect speech makes her future in talkies doubtful at best. Coffey delivers May’s lines with a sharp punch just this side of Katharine Hepburn circa Stage Door in 1937. She’s delightfully wry, but her infatuation with Wernke’s Jerry doesn’t really register, probably because Jerry is such an uninteresting, under-written character. Lane really gets to shine here in ways he didn’t as barely-there Brian in last season’s Tales of the City. He’s goofy and sincere, the opposite of most of the Hollywood folk we meet. He’s a dolt with a taste for crunchy Indian nuts (apparently another name for pine nuts) and terrible taste in women (Ashley Wickett as untalented actress Susan Walker). It’s interesting to watch a man-size ego grow in a manchild like George. My favorite character, and the guy I wish May ended up with, is playwright Lawrence Vail, played by Alexander Crowther. As part of a “shipment” of playwrights from New York, Vail gets completely swallowed up by the studio system. He’s making tons of money, doing no work and losing his mind. The fact that he ends up in a sanatorium for playwrights is just the icing on his crazy cake (wouldn’t it be great to see a play about that sanatorium?). Rucker guides his cast through the mayhem with style and grace. He navigates his actors skillfully through some of the play’s pitfalls and strange bends in construction, and he gives them a tap-dancing curtain call that is almost as entertaining the play that came before it. Once in a Lifetime continues through Oct. 16 at American Conservatory Theater, 415 Geary St., San Francisco. Tickets range from $10-$85. Call 415-749-2228 or visit www.act-sf.org.